Winter meetings does not mean cold days for Mike Carp. Things seem to be getting warmer around the table as Ricky Doyle over at NESN shares with us. 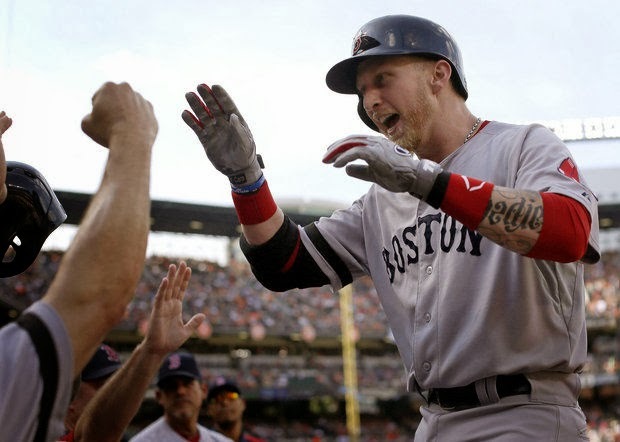 It seems that Mike Carp might want a more prominent role moving forward than the platooning outfield and back up first baseman role he most likely will get if he stays with the Red Sox. The interest could come from the Pirates, Brewers, Rays, and Orioles as they all have first base issues that need to be addressed this off season. This does not mean that the Red Sox have forgotten how important it was to have a good bench, as was demonstrated most of the later half of the 2013 campaign. Hopefully the Red Sox will not deal Mike Carp and look more to losing some of the pitching fat that they have if they feel the need to create some space on the budget for an acquisition during the winter meetings.